Fran was a fervent advocate of fair play for all athletes. His goal was to increase the supervision of open water races, the presence of trained medical professionals, and the education of support staff. His tragic and untimely death exposed the inadequacy of current safety precautions in the sport of open water swimming and acts as a permanent demonstration to the necessity of vigilance in all competitive arenas. We collaborate with safety advocates, medical professionals, and organizing committees to eliminate preventable accidents in athletic competition. To protect his dream, Fran tirelessly searched for financial support as he pursued an Olympic medal. He thought a person’s passion should not be hindered due to financial reasons. The FCEF provides financial support to committed athletes who share Fran’s zeal and class, empowering them to continue to work their dreams and reach their Olympic goals. Fran consistently bettered himself as an athlete by learning from the various coaches and teammates he encountered in pursuit of his dream. He was a student of life and eagerly shared his knowledge with others. The FCEF promotes continuous learning and growth in the sport of swimming through egalitarian goodwill programs that grant learning opportunities to coaches and swimmers around the world. 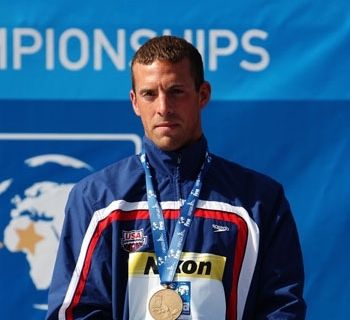 The Fran Crippen Elevation Foundation (FCEF) is a national nonprofit created by athletes, for athletes. It is the mission of the FCEF to pay it forward by supporting athletes while they pursue their athletic dreams. The FCEF acts as a central voice for safety in open water swimming, provides financial support through annual grants and encourages the personal development of athletes though our humanitarian exchange program. Our branches work together to provide a full range of support to athletes who are committed to WORK THE DREAM.